SABA and Farah, 17-year-old conjoined twins from Patna, can never be separated surgically. The reason: presence of just one kidney between their two bodies joint at the head. Even if an operation to separate them is performed, one of the girls will not survive due to the subsequent absence of a kidney in her body. Thousands others in India and worldwide die of renal failure. This is because kidney transplants require a natural kidney obtained from a living donor or a dead body immediately after death. Finding a person willing to part with one of his two kidneys is difficult. Now bioengineered rat kidneys developed by Massachusetts General Hospital (MGH) have given fresh hope for those suffering from kidney disorders. The researchers developed the replacement kidneys by stripping living cells from donor kidneys and allowing another rat’s own skin cells to regenerate kidney tissue onto them. The cell-stripped kidney provides a natural scaffold of collagen and extracellular matrix for skin cells to grow into a new kidney and helps retain natural shape and structure of the organ. 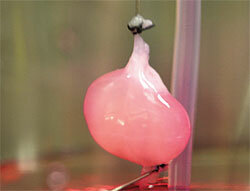 Bio-artificial hearts, lungs and livers have previously been developed by employing a similar approach. “What is unique about this approach is that the native organ’s architecture is preserved, so that the resulting graft can be transplanted just like a donor kidney and connected to recipient’s vascular and urinary systems,” says Harald Ott, senior author of the article and principal investigator at the Center for Regenerative Medicine of MGH. The artificial kidneys were able to produce urine in a laboratory apparatus as well as after being transplanted into live rats. The study was published online in Nature Medicine on April 14. Bioengineered kidneys can someday eliminate the need for human donors by paving the way for developing kidneys for humans using animal kidneys stripped of cells, says Ott. The cell-free kidneys would act as a frame on which human kidneys can be grown using patient’s own skin cells. Sanjay Agrawal, head of the nephrology department at AIIMS, says it is good information and could prove helpful for many people suffering from kidney disorders but if such a kidney would be accepted by the body or not remains a concern. “It is not so simple. There are many more issues associated with kidney problems,” says Agrawal.